Beyond winning the Academy Award for Best Foreign Language Film and the Venice Film Festival’s Golden Lion, the influence of Akira Kurosawa’s 1950 masterpiece is constantly seen in dozens of televisions series looking to temporarily break format. Many diverse shows, including the likes of House, The X-Files, and Fame have all done Rashomon episodes, usually trying to exploit their characters wildly divergent accounts of the same event for comedic event. However, Kurosawa’s Rashomon was a darkly serious examination of human nature and the elusiveness of truth and justice. An indispensible classic from Kurosawa’s considerable filmography, Rashomon screens as part of the Japan Society and MOMA's retrospective celebration of Kazuo Miyagawa: Japan’s Greatest Cinematographer, the gift to cineastes that keeps on giving. It is impossible to say what happened that fateful day in the woods, but it whatever the truth might be, it was awful. A priest and a lowly woodcutter were called to testify and what they heard left them shaken. Seeking refuge under the battered city gate during a deluge, they relate the disturbing court testimony to an insensitive drifter. The two witnesses were the last people to see a samurai and his wife before they encountered the dreaded bandit Tajōmaru. The competing accounts of the captured bandit, the victimized woman, the dead man’s spirit (channeled by a medium), and the woodcutter, largely agree Tajōmaru either roughly “seduced” or outright raped the woman, but what happened next varies drastically depending on the narrative. Much is made of how greatly each character’s version of the truth differs, but analysis of Rashomon often overlooks the commonalities. In each story, something truly terrible transpires between the samurai and his wife after her attack, causing the young priest to question his fundamental assumptions regarding human nature. Indeed, the framing device is the most important part of the film. Great effort and expense went into creating the hulking Rashomon Gate set and it is through the drama that plays out there between the three strangers that Kurosawa really makes his statement about the nature of man. The woodcutter is the sort of role Takashi Shimura seemed born to play—timid, somewhat compromised, but ultimately redemptive. 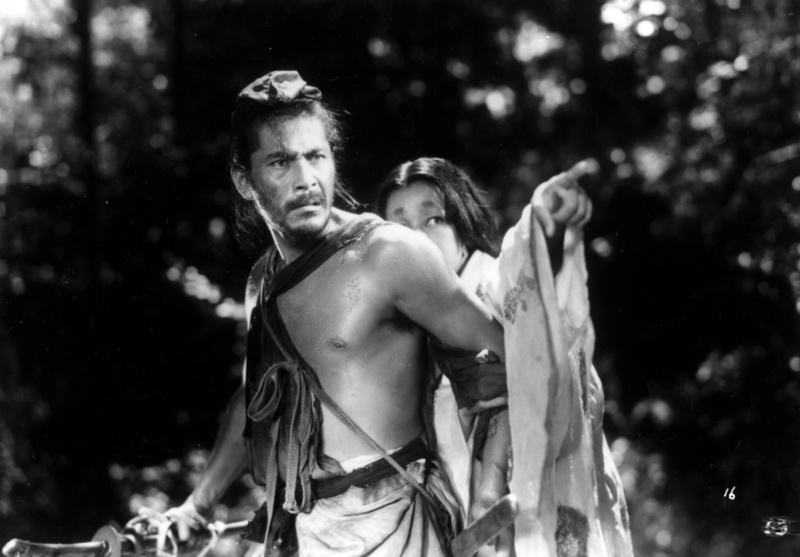 As the notorious brigand, Toshirō Mifune goes over the top and around the bend, but his craziness adds an undeniable edge that heightens Rashomon’s unsettling effect. Yet, it is the haunting performance of Machiko Kyō, simultaneously heartbreaking and baffling, that truly defines the film. From the subjectivity of its competing narratives to cinematographer Kazuo Miyagawa’s use of sunlight and shadow, Rashomon has been enormously influential, inspiring a host of inferior imitators, like Jennifer Lynch’s absolutely dreadful Surveillance. Surprisingly subtle given its reputation and Mifune’s go-for-broke performance, it remains an intriguing puzzle of film. A masterful milestone of international cinema, no Kurosawa retrospective would be complete without it.